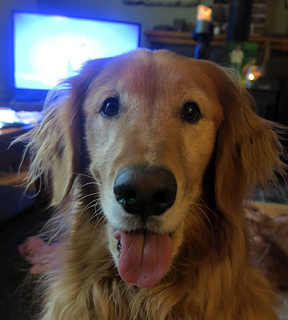 Liz and family are off on a trip, so I am dog-sitting Phoebe, who is actually my dog Em's daughter. They were both adopted years ago from the Lawrence Humane Society Shelter. I saw my Em across a parking lot, as I was taking photos of other dogs. Best I can tell from Em's bio...a Kansas breeder had too many dogs and had to give some up or be closed down. Kansas Health Department..So I put down money on Em and first litter pick. That did not exactly hold, as preference was given to a staff member. But I got daughter Liz in family in on a nearly first pick. This litter and Em were hand raised by a staff member volunteer. I am indebted to her to this day. I guess this is why I continue to take photos at the Shelter. Pay it backward. Pay it forward. On the day they picked a puppy, from cages, grand daughter Maya cried and could not choose. She liked one, but what about all the others? It WAS so hard to choose She chose right. This week at my house. Em and Phoebe play. They know the rules. 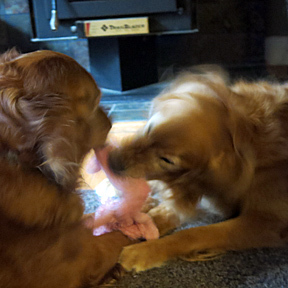 They enjoy a toy tussle and tug of war. 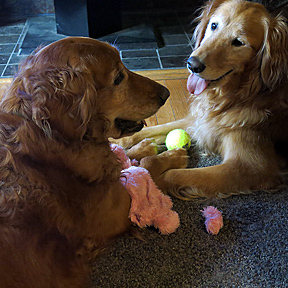 (Old Bodie, now gone, taught the Tug game.) They enjoy rolling around and pretending to bite each other's face Fiercely but in the end...gently. No one yelps or argues.